Whether a brand can be an outstanding one is deeply related with the title, characteristics, quality, credibility and culture. "Bluelight" integrates all these elements together, which is the compound brand of high-technology, culture and times, and it expresses the objective requirements to the products of the integrative economy and culture. Shape of Brand: It looks like a rocket in a whole with Chinese and English names, and the main body stands a 45-degree angle with the plane in a trend of escalation, which symbolizes the rise and development of the company. Firm Tri-feet: The whole picture of the brand is in a form of a triangle with three feet (angles) standing upright, which implies the unity of manufacturing, supply and sale and the integration of scientific research, industry and trade. 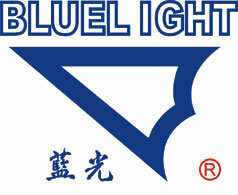 Pattern of Brand: Composed by the initials "B" and "L" of the words "Blue" and "Light" with the point up into the air, which means the tenet of the company "To be the one in first-class". And the two Chinese characters were written by a handwriting master Wang shi Jie. Implication of Brand: Since American people named the first rocket launched to the universe as "Bluelight", it had become the symbol of high-technology and the milestone of a new age.